At the age of 5,the gifts of God upon the life of Pastor Chidi Onyesonwu began to manifest: He prayed for the sick and they were healed. He prayed for the barren and they conceived as well as many others. ’Father’ ie. Rev Father took over his name till this day because of the wondrous miracles God did through him. At 9, he realized he was naked like Adam and Eve and began to shy away from people: he stopped praying for those who he could pray for. Consequently God started dealing with him until he was good for nothing. Even his academic was affected; he failed his Common Entrance Examination and The First School Leaving Certificate Examination. As a result, his father wanted him to learn carpentry. But he realized himself and prayed God for Divine mercy and wisdom, to go to school to study and become a priest. Miraculously, God intervened and he went back to school. He became extra-ordinarily brilliant, passed all his examinations to the glory of God-the Giver of Wisdom. He could have enrolled in a seminary school to fulfill his quest to be a priest, but seminary education was too expensive for his parents who were his sponsors. He however, proceeded to Paternoster Secondary School Ekwerazu, where he was made the Chapel Prefect and the Spiritual Director. In 1996, he surrendered to the Lordship of our Lord and Saviour Jesus Christ at the Faith Renewal Ministries International, Olodi Apapa Lagos. In 1997, he was baptized by immersion. He was trained and ordained as a minister of God in 1999 by Rev Dr Morris Cerullo at The Redeemed Evangelical Mission (TREM) Obanikoro Lagos and was baptized in the Holy Ghost same year. 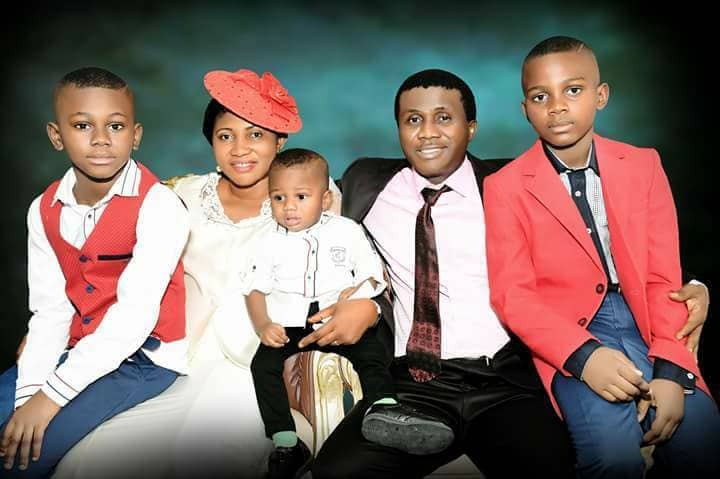 Pastor Chidi Onyesonwu was born to the family of Mr. Francis Eluwa and Mrs. Christina Onyesonwu (of blessed memory) of Umuchieze Ihitteafoukwu in Ahiazu Mbaise Imo State Nigeria. He has a University degree in Business Administration from Lagos State University, Ojo. He is happily married to Pastor Mrs. Chinyere Onyesonwu. And like Noah, favoured with three great sons: Abdiel Yagazie Chiemezie Chidi, Royal Chinomnso Chidi and Kadmiel Chizorom Chidi. On the 20th of October night in 2006, God revealed the SAVING ARK CHRISTIAN MINISTRY to him with the tabular inscriptions: ‘PREPARE MY PEOPLE FOR RAPTURE.’ and ‘AS IT WAS IN THE TIME OF NOAH’ and ‘GO AND TELL MY PEOPLE THAT I AM COMING BACK SOON.’ The meaning of Saving Ark was not clear to him until he went online to search out the meaning. However, there was no result. That same night, in a dream, a Finger pointed him to Genesis chapter 6. ‘Genesis 6’ was bold as if there was a magnifying lens on it. When he woke up he reached for his Bible. Thus, the birthing of the great Ministry, Saving Ark Christian Ministry on the 21st of October-his birthday!!! God has been very Faithful to him. Pastor Chidi uses every available tool to preach the gospel: The internet, the tracts, the media, etc. He preaches in schools, hospitals, churches and at crusades and souls have been returning to Jesus Christ. More so, the sick people have received their healing, the barren have conceived; so many miracles to the glory of God the Father. In addition he has worked as a minister with different Redeemed Christian Church of God, (RCCG) parishes in Abuja. He resigned his juicy appointment as a Federal Government Officer in National Council for Arts and Culture under Federal Ministry of Information and Culture, in order to concentrate on the Church work. A man of God with great passion for Souls. He diligently and of course by the Special Grace of God guides people to that CITY whose Builder and Maker is Jesus Christ. Hallelujah! By the special grace of God, Pastor Chidi Onyesonwu is the Lead Pastor and the Gate-Keeper, at the Saving Ark Christian Ministries World Wide.